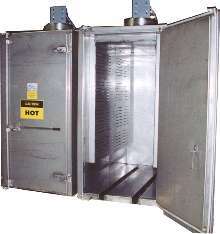 Batch Ovens suit various heating applications. Industrial batch ovens are electrically heated and provide uniform heating capabilities up to 750Ã‚°F. Products are designed specifically around heating requirements of each application, and offer precise temperature control, choice of airflow patterns, and all-welded, carbon-steel construction. Steam-heated and gas-fired models are also available. Drum Warmer heats one 55 gal drum. 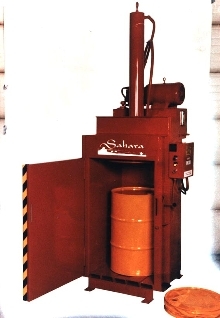 Sahara 5 kw HOT CAN is made of heavy duty steel and provides temperatures up to 250Ã‚°. It features thermostatic controller and optional voltages. Unit is suitable for dispensing applications. 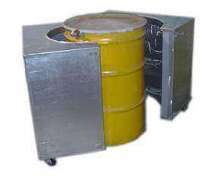 Drum Crusher reduces drums down to 4 in. Sahara combination Drum Crusher/In-Drum compactor reduces waste volumes for safe and economical disposal. Explosion proof construction makes it suitable for use in NFPA Class 1 Division 1 areas. It has stainless steel construction, removable floor for forklift handling of heavy drums, and quick change head for easy conversion to in-drum compacting mode. Stationary Platforms service trucks and tank cars. 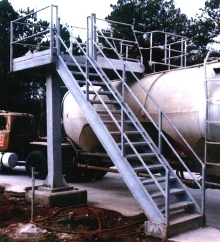 Platforms with slide track mounted access equipment provide safe access and fall protection to tank/bulk trucks, tank cars, and hopper cars. It has 3 ft wide swing gates with 4 in. toe plate, and meets OSHA requirements. Fabricated slide track platforms are available from 6 to 60 ft long. Hot Box safely heats eight 55 gallon drums. Sahara horizontal Hot Box Model S8 uses steam up to 200 psig, and can reach temperatures up to 300 deg F. Constructed of 304 stainless steel, Hot Box replaces homemade hot rooms and band heaters. It provides 110 gallon spill-containment capacity. Alternative capacities, electric model, and carbon-steel construction are also available. INSTA-RACK features single pedestal platform with access stairway and equipment. 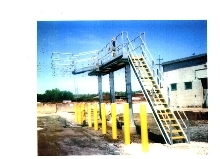 Unit provides safe access and fall protection to tops of bulk/tank trucks, tank cars and hopper cars. Safety Gate takes up only 10 in. of aisle space. Protect-O-Gate Clear Aisle reduces potential for falls and other accidents associated with mezzanine loading areas. When corral is in raised position, gate takes up 10 in. of space on mezzanine ledge. It provides access to work area from 3 sides. Pivoting, pivot-and-slide and swing gate models are also available. Sahara 6-tote Hot Room can heat up to 6 totes; each tote has one 4 in. port hole for hose. It us suitable for pumping from totes, and its smaller access doors provide access to make connections to pumps without having to open larger doors. Steam or electrically heated, Hot Room features spill containment capacity, temperature control and stainless steel or carbon steel construction.